The amount of cooling a room requires to maintain a comfortable temperature, is effected by the Structure of the Building and Internal heat gains. To assist in establishing the amount of cooling required, we have produced for your assistance a simple to use, downloadable Heat Gain Calculation Guide where details of the area may be entered. This results in a more accurate estimation of the cooling requirement than online calculators, as it allows other influencing factors to be taken into account. We would strongly advise against any estimations based upon the floor area or volume of a room. Please Telephone 01306-883689 to speak to an experienced design engineer for help and advice. Building Structure :- Area of Glazing, Double or Single Glazed Windows, Direction that the windows face, Area of external walls, Roof area pitched or flat above, Roof Lights, Pitched Roof Glazing. Internal :- Number of Occupants, Number and type of light fittings, Number of Computers or other electrical equipment that produce heat, Fresh Air Allowance. This is a worked example of a typical Office, shown with the relevent information from below added. Lighting - 4 No Fluorescent light fittings each with 4 x 4ft tubes and 1 No suspended light bulb. Occupancy - 6 No Staff each with their own PC. Glazing - 2 No windows 1.0m wide x 1.2m high facing SW that are double glazed. Roof of Floor Above - The room is located on the 1st Floor of the building with a loft space above. External Wall - There is only one external wall 5m long and 2.4m high. Occupancy - 6 No Persons occupy the room.Occupants has a personnel computer with screen, there are no other significant electrical gains. Heat from Equipment - Occupants have personnel computers with screen, there are no other significant electrical gains. 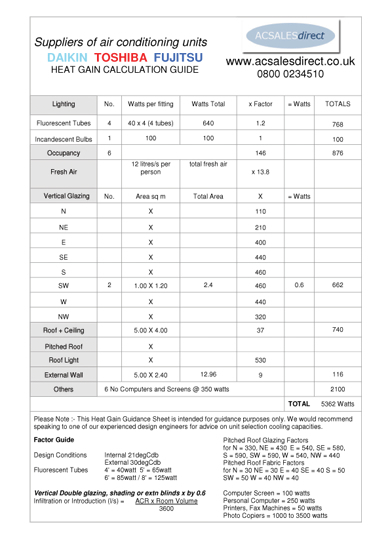 The Heat Gain Calculation Guide can be used for most areas and although the cooling load has been established, it is sometimes necessary to consider the usage of the area. The cooling capacities shown in brochures are almost always based on the fan coil unit operating on high fan speed. It may therefore be worth considering a system with a slightly larger cooling capacity to allow the air conditioning system to maintain the required temperature on medium or low fan speed for reduced noise level. Other areas which require additional consideration are Server Rooms or areas which have a large proportion of electrical equipment and create alot of heat. We would recommend speaking to one of our application engineer for further assistance when air conditioning specialist areas. Once established, Step 1 is to decide on the style of internal fan coil unit, a range of styles available can be seen on our Home Page >>. Step 2 is to decide where the external condensing unit can be located. It is important to establish that the length of refrigeration pipework between the internal fan coil unit and external condensing unit is within the manufacturers recommended maximum lengths. These are shown on the manufacturers brochures which you can download. If you do not feel confident in calculating the heat gains, or there are multiple areas which you are considering, please speak to one of our experienced engineer on 013060883689. For larger projects, it is possible to arrange for an engineer to visit your site. A charge would be made for this site visit based upon your location, which would be deducted from any order placed.